The ICAA Workshop at TCU introduces the language and practice of classical architectural design with emphasis on its application in the design of new buildings and interiors. The workshop begins with professional presentations that feature case studies of recent work in this field. 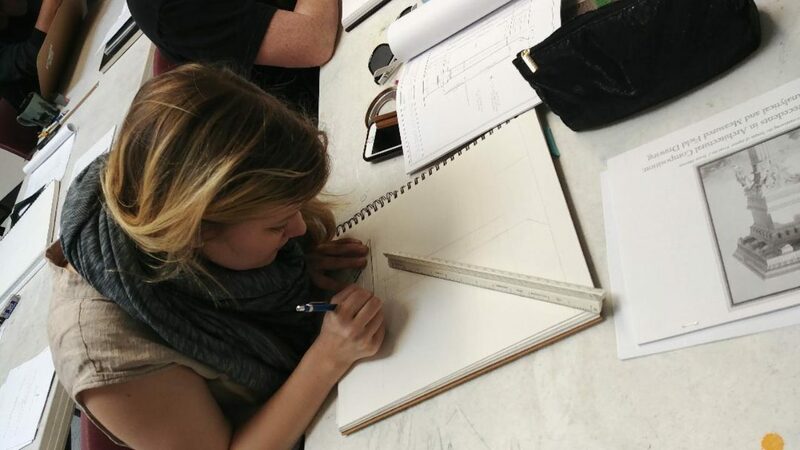 Following this, instructors guide participants through a series of hands on drawings that introduce the elements of the classical language and a method for studying the wealth of material found in precedents to inform new design. The workshop concludes with an optional visit at 2:30 PM to see an application of the classical language in a contemporary residential setting. Preceding the workshop, a reception and talk by Tom Savage of Winterthur Museum is being hosted by the ICAA Texas Chapter on Thursday evening. The workshop and Tom Savage lecture are free for students, but students will still need to register for both events online. Students may register separately for the lecture with Tom Savage here. • The nomenclature and proportional relationships of the classical orders and their role as a language and tectonic system. • A method for drawing a classical order modelled after the architect Vignola, proceeding from a block layout of principal components, to details of key elements, to their application within a composition. • The use of the sketchbook from the Renaissance to present day as a tool for studying adaptations of the language in architectural precedents. • Field techniques for measuring and drawing to scale in a sketchbook to develop a sensibility for physical dimension, scale and composition. • How the wealth of material found in precedents can inform new design.